Canada’s Other Drug Crisis | Full Circle Home Care Inc. 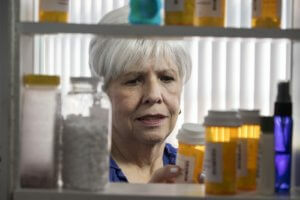 Older Canadians are popping a lot of pills, but the medications can be doing more harm than good. What are the risks and how can you avoid them? As we get older, we are likely to take more medication. Multiple medication use (prescription or over-the-counter OTC) is a common concern in relation to seniors’ health. According to Health Canada, In 2005 pharmacists dispensed an average of 35 prescriptions per person aged 60 to 79, and 74 prescriptions per person aged 80 or older, compared with an overall average of 14 prescriptions per Canadian. People who take several medications at once are more likely to have adverse drug reactions; seniors are particularly vulnerable because of co-morbidity and physiological changes that come with age. It gets worse. Older adults, especially those experiencing serious health issues, are more likely to have emotional, physical, cognitive, social and functional changes that may encourage them to seek out more medications to cope. In addition, it’s estimated that 14% of adults aged 50 and up have a mental illness such as depression or anxiety. Left untreated, depression can lead to drug abuse. The number of older adults taking three or more psychiatric or pain medications has more than doubled in the last decade, according to a Centers for Disease Control and Prevention (CDC) study of data collected from primary care physician visits. Finally, care facilities may dole out powerful antipsychotics to elderly residents to keep them manageable by staff. A Health Ministry study commissioned after the Toronto Star began investigating the practice found nearly half of Ontario nursing home residents aged 65-79 are being given “dangerous” drugs consisting of sedatives such as diazepam and lorazepam. Despite warnings that the medications can kill elderly patients who suffer from dementia, the report further reveals that some long-term-care homes, often struggling with staffing shortages, are routinely doling out antipsychotics to calm and “restrain” wandering, agitated and sometimes aggressive patients. Every year, Canadian hospitals admit thousands of older adults do to adverse medication reactions according to several recent studies. And one of the biggest health hazards for seniors is falling and breaking a hip – often a result of multiple medications which can cause cognitive difficulties and affect balance. The good news is awareness of the scale of the problem is growing. More and more physicians are initiating “deprescribing” discussions with their older patients. “Deprescribing” is exactly how it sounds — the deliberate and conscientious stopping or tapering of prescriptions to help improve health outcomes. Some long-term care facilities are now required to do periodic medication reviews and weed out unnecessary, ineffective or hazardous pills. A recent massive Canadian Foundation for Healthcare Improvement demonstration project has shown how to reduce the inappropriate prescribing of antipsychotic medications to seniors with dementia. If you want to join the deprescribing revolution, don’t do it by yourself. Have a conversation with your doctor or pharmacist who will be able to help you decide if you are on the appropriate medications, which medications could be safely reduced or eliminated and how to do so. As people get older they should constantly ask if a new medication is going to affect the things that are important to them: their mobility, cognitive abilities and capacity to enjoy life. Caregivers and seniors, most importantly, have to be ready to assert their wishes when it comes to taking too many medications and always be alert to the possibility that more medication might mean more problems. Consult the Institute for Safe Safe Medication Practices Canada website for a list of potential harmful medications. 4. Help cognitively impaired adults to monitor medications. 5. Create and maintain a current medication list. 6. If in doubt, get a second opinion. 7. Know the side effects of your medications. 8. Check if the pharmacy label states what the medication is for. 9. Use the same pharmacy and pharmacist whenever possible. 10. Ask your pharmacist questions.